Sky Editor comes bundled with psy_commando's tools, and this project is a wrapper for StatsUtil, letting you edit scripts, Pokémon data, and more. Before continuing, please make sure you've reached the "Making Mods" section of the Sky Editor guide to ROM editing. 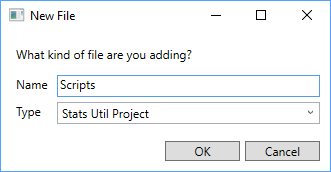 On the New Project window, choose "Stats Util Project" in the drop-down, and fill in the name with something that makes sense. Then click OK. Wait for the loading to complete. This may take a while depending on your computer. All of the XML files that statsutil created are in (Solution Directory)/(Project Directory). Do not touch the "Raw Files" directory, since that's for Sky Editor's use only. LSDTable - This is basically a list of script definitions. ScriptSequence - controls what happens afterward (this is where the bulk of the stuff happens). Refer to psy_commando's thread for additional instructions regarding statsutil. You shouldn't have to worry about any of the command-line stuff, since Sky Editor handles that. If you have any additional questions, you can either ask in psy_commando's thread or create your own thread in the ROM Editing Help forum. So about the XML files for the Pokemon and moves, I want to try adding Arceus to the game. would editing the XML files for the placeholder pokemon and $$$ work? Or is there more to it than just that? You'd also need to take care of the graphics and animations. @psy_commando's gfx_crunch can help with that, but I don't even know everything that'd be involved with inserting Pokemon. If you try out what you can, I'd love to hear your findings.